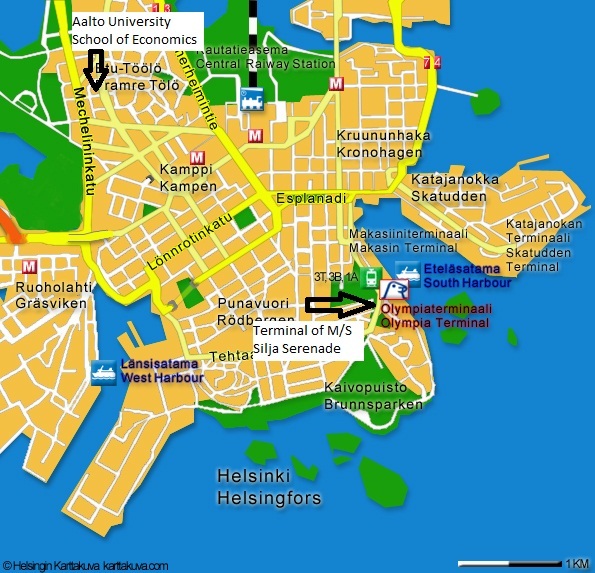 The map below shows the location of Aalto University School of Economics and terminal of M/S Silja Serenade (Olympia Terminal, see the web page for more information). The distance between Aalto University and the terminal is approximately 3km. Organizers have arranged transportation from the Aalto University School of Economics to the terminal on 24th of November. Kalle Rinne will deliver the boarding passes to the M/S Silja Serenade at the terminal. If you come directly to the terminal (see information below), please contact Kalle Rinne for instructions how to get your boarding pass. Please note that you need to arrive before 16.15 to have enough time for boarding. Olympia Terminal is also easily accessible by public transportation. Tram 3T goes directly from Central Railway station (and also from Aalto University School of Economics) to the terminal and back (travelling time approximately 15 minutes). You can check the time table here (From = Central Railway Station To = Olympiaterminaali). Tram will cost 2.20€. Taxi for the same trip will cost approximately 10 euros depending on the number of people travelling and traffic. The EURO Working Group on Financial Modelling was founded in September 1986 in Lisbon. The primary field of interest for the Working Group can be described as "financial models that help to solve problems faced by financial decision makers in the firm, intermediaries and the investment community". • cooperating and exchanging information with other universities and financial institutions throughout Europe. It can be stated safely that the Working Group has become an established one. To give an idea: over 450 members, 48 international meetings organized all over the world, a Paris’ Award introduced in 2009 for young scholars and an own newsletter (NEWSFLOW) are some of the examples of the role played until now. The Helsinki-Vantaa Airport is located about 25 km north of Helsinki city center. Around 120 international flights per day arrive at Helsinki-Vantaa Airport. It is the only international airport near Helsinki and has good connectivity to the major European destinations. Taxi from the airport to city center takes 30 minutes and costs approximately 35-40 euros depending on your destination and when you travel. Taxis always use a meter and the tariff is same for all cars so it is safe to take the first taxi on the line outside of the arrivals halls of both Terminal 1 and 2, tipping is not expected. The most common credit cards are accepted. There are also bus connections. Finnair City Bus leaves in front of both terminals every 20 minutes and terminates at central railway station, approximately 1 kilometer from the Aalto University School of Economics. Finnair City bus costs 5.90 euros and takes 35 minutes. The most common credit cards are accepted. Local buses 615 and 615T also operate between the airport and the central railway station with travel time of 35-45 minutes. The cost is 4.00 euros. Only coins and 5, 10, and 20 euro notes accepted. Intending contributors should submit the titles and abstracts, and should include the authors' names and addresses (with the presenting author listed first). Abstracts should be submitted by e-mail to the contact person Mr. Kalle Rinne. LaTex, DOC and DOCX file formats are accepted. Due to the numerous requests we are receiving, the deadline for submission is extended to September 30, 2011. · Submission of Abstracts: September 15, 2011 extended to September 30, 2011. One of the advantages of the mini cruise seminar is that the boat will provide the social program for the nights of November 24-25. After the Meeting, Helsinki's location provides an excellent home base for visiting other parts of Finland, Estonia (see for example Tallink Silja) or the St. Petersburg area of Russia (see Allegro train to St. Petersburg). Cost of the meeting is 400€ including the registration fee and costs in the M/S Silja Serenade (a cabin, coffees and meals). A student fee of 200€ can be applied (students are going to share a cabin). Registration is now open. Please note that the system requires payment online. Please use newest version of browser and allow cookies! Link to the registration and payment system is here. Registration and payment deadline is October 25. Please note that at the moment we have reserved 40 cabins. We will try to reserve more cabins if demanded. However the availability of cabins is usually very limited during November. Therefore please register as early as possible to guarantee your place. The temperature in November is usually between +5°C and -5°C. In average there are 19 rainy days in November (rainy meaning in this case rain, sleet or snow). In addition be prepared for darkness (especially if there aren’t any snow), as the sun will rise at 9.45 AM and will set already 16.30 PM. Be sure to bring warm clothes! The local currency is Euro.